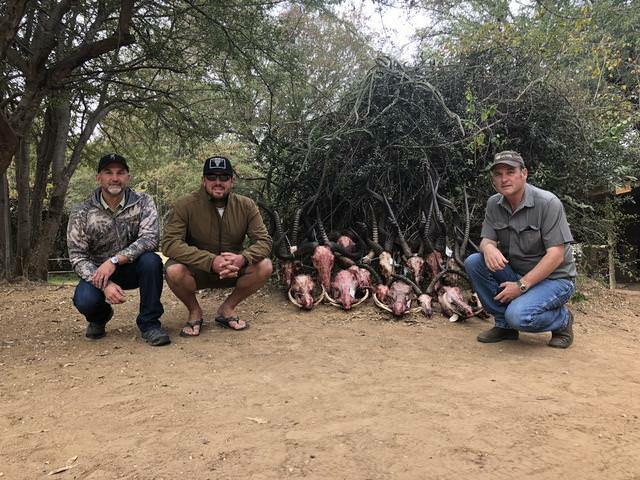 Some may frown upon a hunting report - written by an Outfitter - as opposed to a long standing member of this forum with at least a 1,000 posts behind his name to prove his credibility. 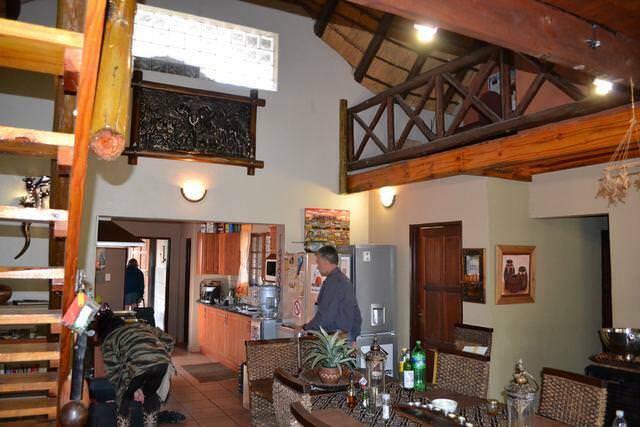 We started our tour by booking into a villa in the little village of Wilderness which would be home for the next few nights and was to be used as base for our daytrips to Mossel Bay, the Cango Caves, Plettenberg Bay and several of the other attractions that makes the Garden Route a unique place to experience. From Wilderness we travelled up the coast towards Jeffreys Bay before checking into Addo Wildlife next to Addo National Park. This gave our two travelers an opportunity to experience Addo National Park before heading further North-East with us towards Port Alfred for our first attempt at Caracal over hounds. Regrettably the Caracal weren’t cooperating in this area and after two unsuccessful days of hunting we packed up and headed inland to the town of Steynsburg where we would continue our efforts. 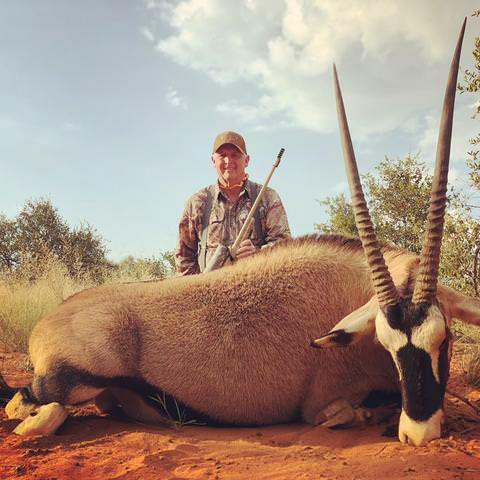 Our first day in Steynsburg started off well and resulted in Tom bagging a beautiful Mountain Reedbuck Ram with a borrowed Howa 6.5 Creedmoor . As I had discovered a couple of years ago when another client of mine used this caliber; the 6.5 Creedmoor is a great cartridge for medium to longer range shooting of African game. I have since grown to like the cartridge so much that I acquired a rifle of my own chambered in this caliber. 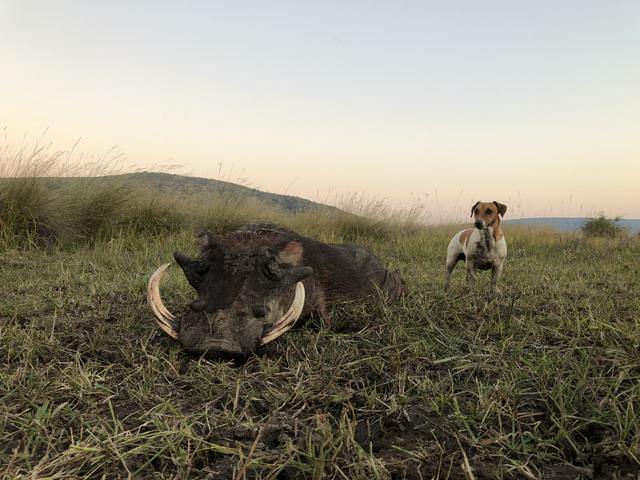 That night we attempted to call in Caracal but to no avail and the following morning we headed out to the mountains of Molteno to hunt Vaal Rhebuck. We found a group of Vaalies early in the hunt but could not get a shot at one and for the rest of the day the Vaalies evaded us. The following morning we were off to Molteno again for another attempt. Whilst we saw quite a few Vaal Rhebuck in the morning, they always kept to their preferred distance of more than 400 yards and again we couldn’t get a shot. Our luck changed however in the afternoon when Tom got a shot at this ram. Whilst the ram was missing half of his one horn, he was an old one and the other horn made up for it. It measured 10” - really exceptional for a Vaal Rhebuck! 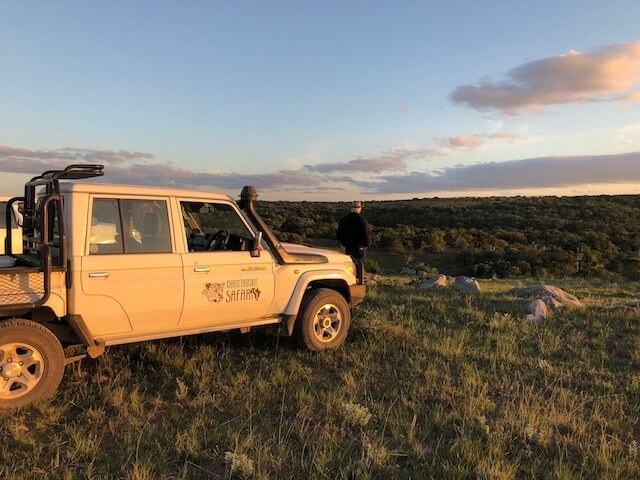 Our hunt wasn’t over yet and we continued our quest for Caracal at night… Time was beginning to count against us as we were nearing the end of our hunt and it seemed all the Caracal in the whole Eastern Cape were attending the annual caracal conference at a venue not known to us. 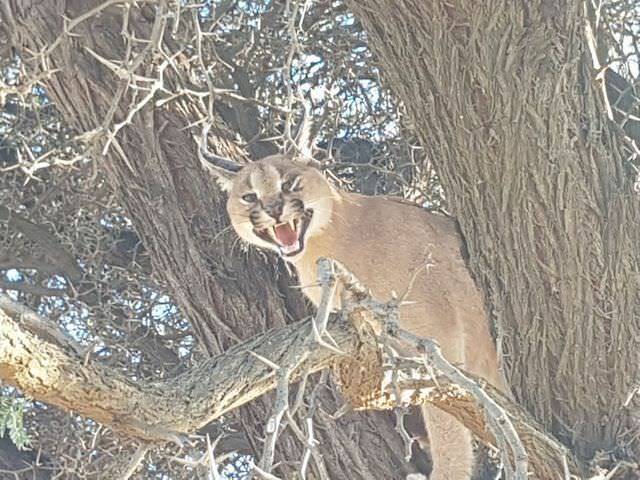 So I decided to head further North and have another go at Caracal over hounds in the Free State. Well I got a call earlier than expected in the morning, to say that the dogs were on a fresh track and we’d better get there in a hurry. Halfway towards the designated area I got a text message with a photograph of a treed cat! 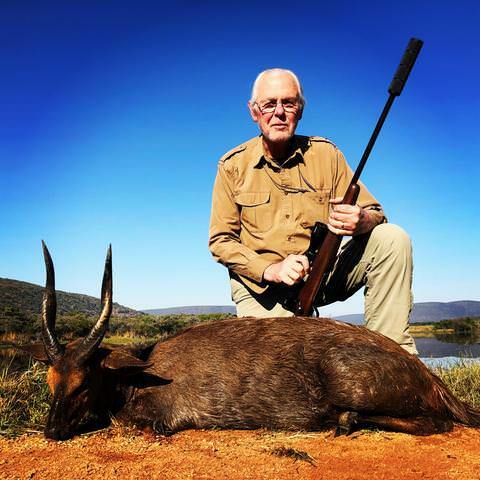 And so ended a successful hunt for Vaal Rhebuck, Mountain Reedbuck and Caracal. Very nice report so far, keep it up. If its recoil does not bother you, do as Mac did and buy a .300 Weatherby. Ammo might be hard to find in many places, but you should be able to plan ahead and take enough for where you're going. It's certainly enough gun for anything that walks in this world, including an elephant in a pinch if you have solid bullets and you can convince the local game guard that it's a legal caliber. 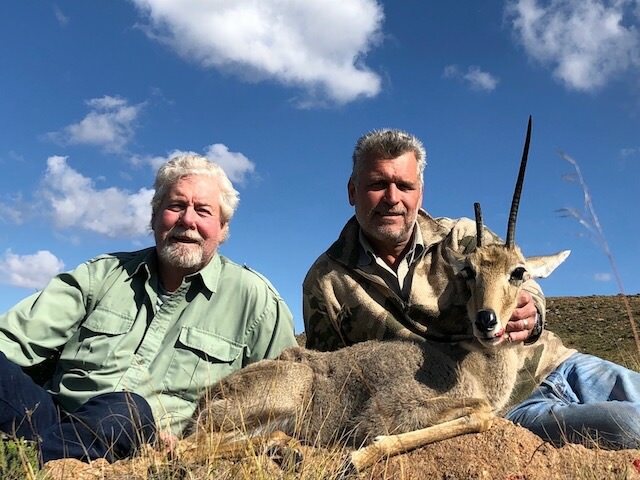 We finished with Tom and Janet’s hunt on May 5th in Bloemfontein. On May 7th we were back in Johannesburg where we greeted Kim and (another) Janet from Idaho. From here we headed directly back home towards Sabrisa Ranch. The following morning we checked rifles and headed out for the day’s hunt. 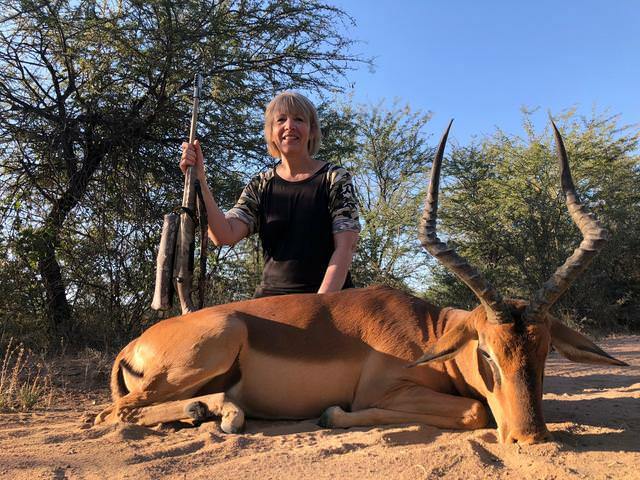 Later that same morning Kim connected with this very nice Impala which he shot perfectly at about 60 yards. 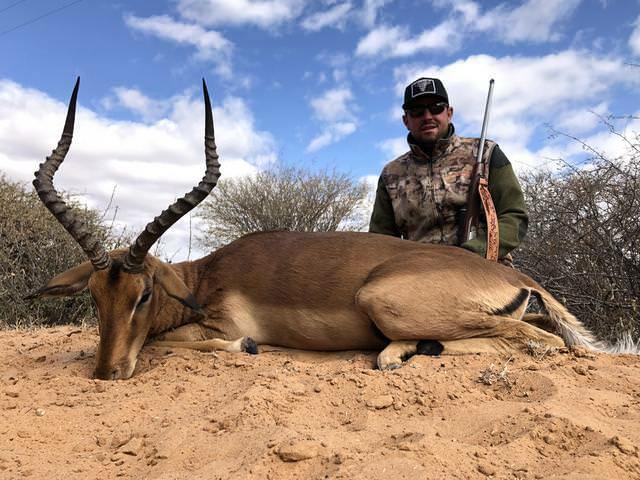 This Impala was taken on one of my new 15,000 acre concessions and the first of many animals I was to hunt there this year. 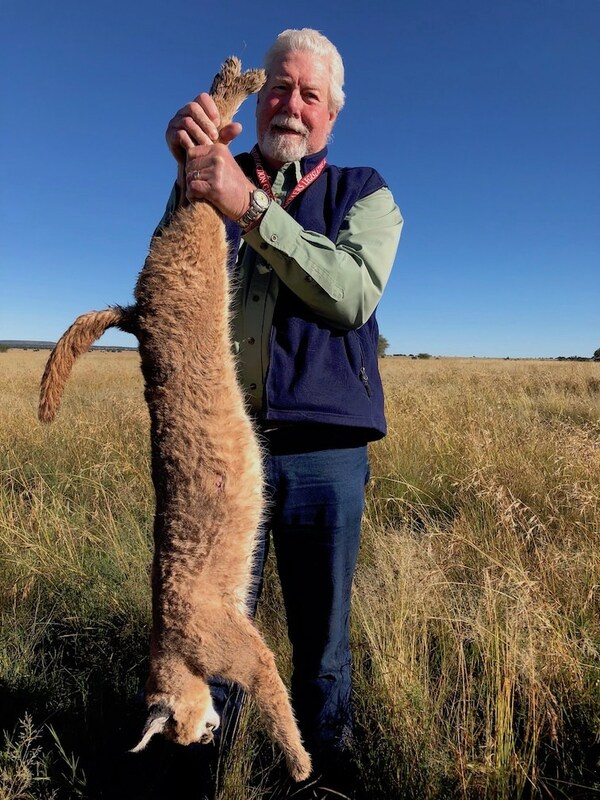 I acquired hunting rights to four new large properties that haven’t been hunted for more than 6 years and this shows in the quality of animals we’ve hunted there this year. The next day we hunted another property I’ve been hunting for a ling time and which is known for amongst other great Kudu and Waterbuck. 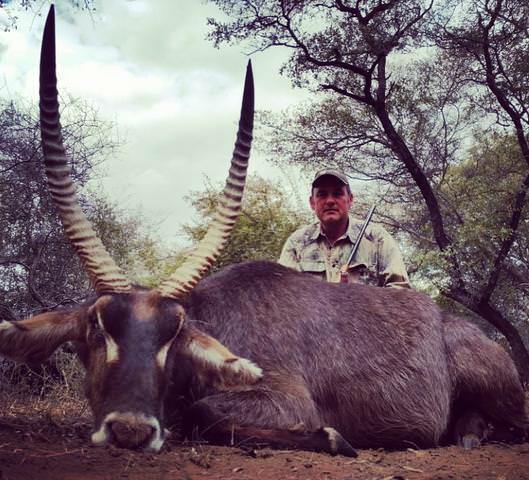 We came across the Waterbuck bull in the picture below and Kim and his .30-06 did the rest of the work. A very nice trophy measuring 29”! Another animal on Kim’s list was Zebra. 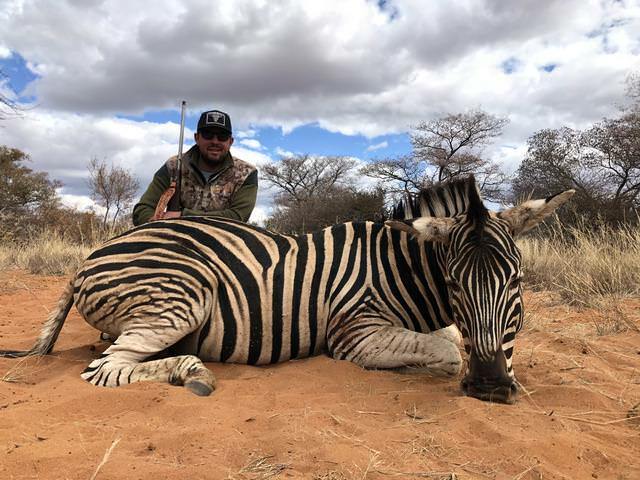 Although the uninformed compare hunting Zebra to shooting a horse, those who have hunted them know differently. This stallion was hiding in the thick stuff but finally gave Kim a shot. 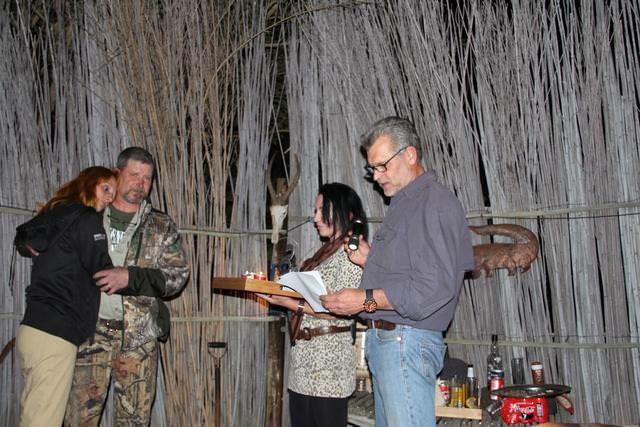 CT Safaris recently went into partnership with Zambesiaka Stud Game Breeders - owned by Fritz and Salome Hoogendijk. 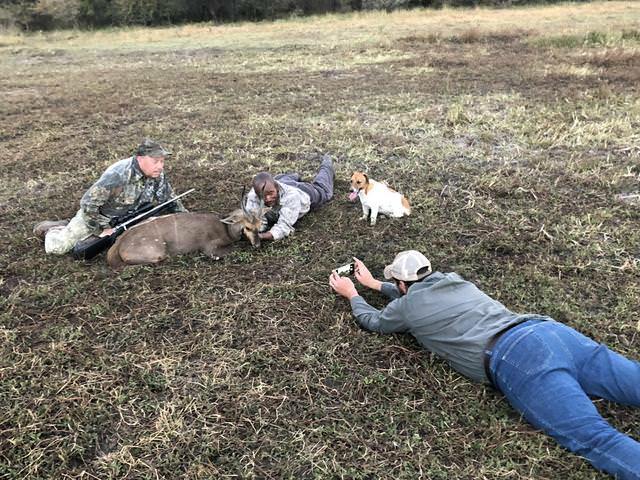 Whilst our two businesses still operate independently, our arrangement puts us in the (somewhat) unique position to offer hunts for color variations in a game ranch environment as opposed to simply shooting them in camps. 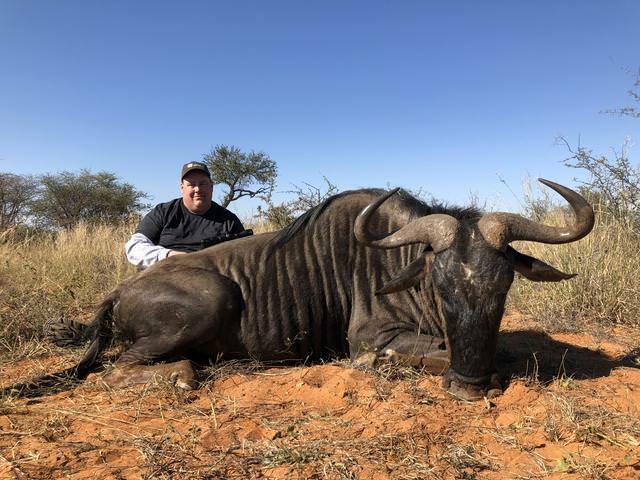 Kim was given the option of changing the Blue Wildebeest on his list for a Golden Wildebeest and he took us up on our offer. The result was the Golden Wildebeest in the picture. What this bull lacked in spread, he made up for in character and in the challenging circumstances he was hunted under. 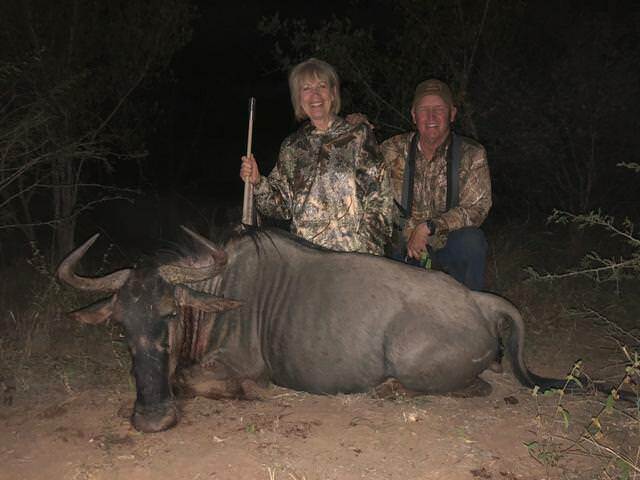 Janet also wanted a Blue Wildebeest - not for the horns but rather for the rug and this we made happen on day 4. when she shot the Wildebeest cow below. Janet did not only make a perfect shot under difficult circumstances in failing light. She made also made her husband very proud! It was early May and the Impala were busy rutting. We found two rams fighting in the road and decided to intervene. 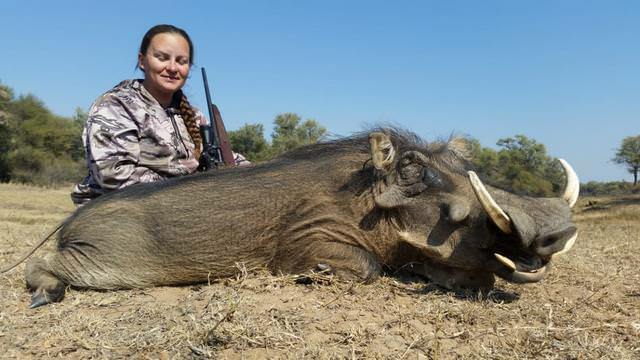 Today I can unequivocally state that a 168gr bullet from a .30-06 is more dominant than any Impala ram…. 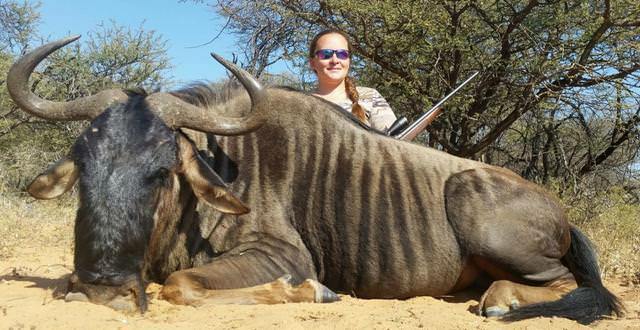 Kim got a shot at an Eland bull the next day. 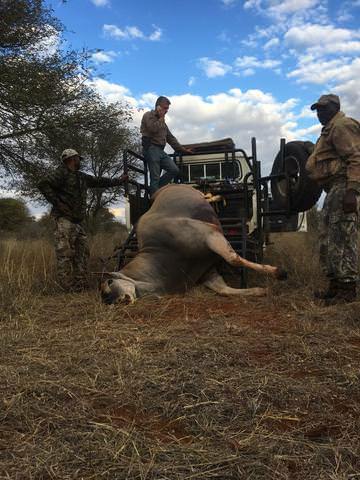 At 250 yards the drop was a little more than anticipated and went through the brisket of the Eland. Some amazing tracking work by Sammy - my tracker - helped us kill the bull a couple of hours later. The next day we hunted for Gemsbok. Whilst females were abound the bulls could initially not be found. Our luck changed in the afternoon when Kim killed this nice bull at 100 yards. 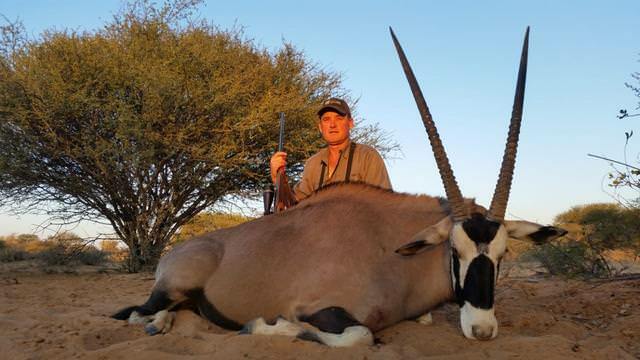 Now it was Janet’s turn and we returned to the same area as where Kim had gotten his Gemsbok the day before. 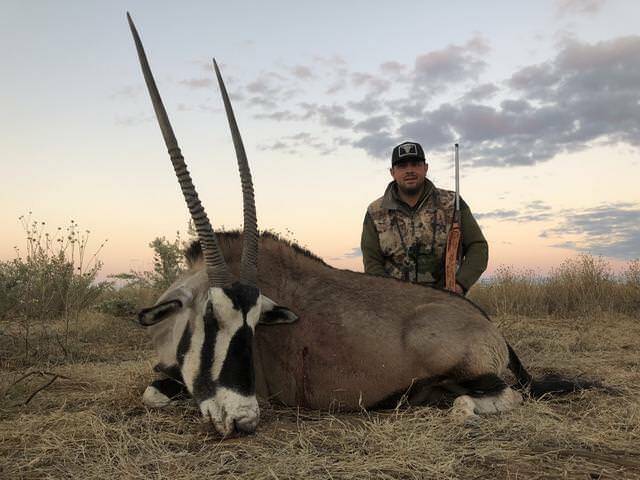 We spotted a group of Gemsbok with a decent bull amongst them and commenced the stalk. Finally, one hour later Janet got a shot at the bull in the picture and made her shot count. 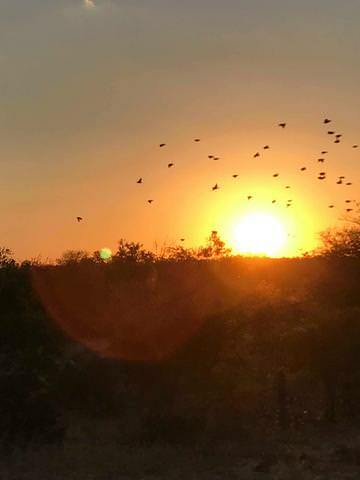 This was the perfect ending to a perfect hunt and two more clients became two good friends during their 10 day trip with CT Safaris. My next clients to arrive were Frank and Lola from WA. 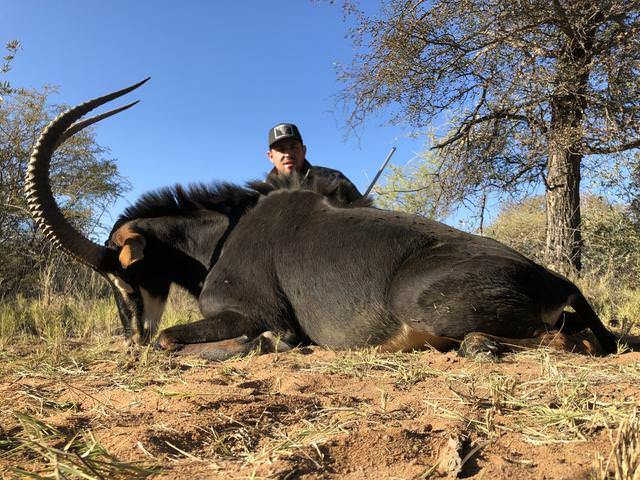 Frank’s dream was to hunt a Cape Buffalo with his Chapuis double in .470NE and I had every intention of helping him make that dream come true. 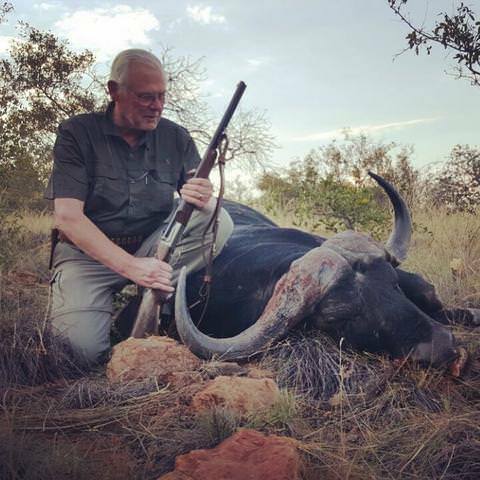 Now in some circles there seems to be a perception that hunting buffalo on South African ranches is not the “real deal” and that we’re in fact shooting “domesticated cattle” instead of hunting. To each his own - but I’ve hunted a few buffalo in my career - both in high-fenced areas and in free ranging areas. Granted, I have never hunted Buffalo in a 200 acre camp (as reportedly happens from time-to-time in certain places) so I wouldn’t know anything about these types of experiences. But one thing I know for sure is that none of the Buffalo hunts I’ve participated in can be likened to shooting cattle in a pen. After spending the better part of the day on the tracks we’d been following and spooking the herd several times, resulting in a thunderous crash through the bush as the Buffalo departed in haste, we finally got a chance to look them over when we found them bedded down in the heat of the day. We were a little disappointed as, while there were a couple of big bodied Bulls in the group, none of them were shooters. The following day we tracked down several different groups of Buffalo - some with good bulls in them and some not but we didn’t get a shooting opportunity. On day 3 our luck changed and we found two bulls together. The wind was in our favor and constant so we managed to stalk up to about 50 yards from them. 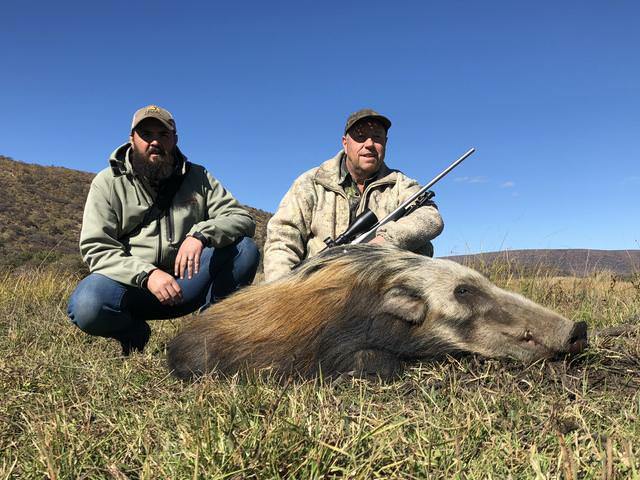 Frank’s dream was made true when he made his first kill with his .470 by placing a 500gr Hornady through the Buffalo’s shoulders. Day 4 was dedicated to Bushbuck hunting and I knew of a place where I’d seen a nice one hanging out. 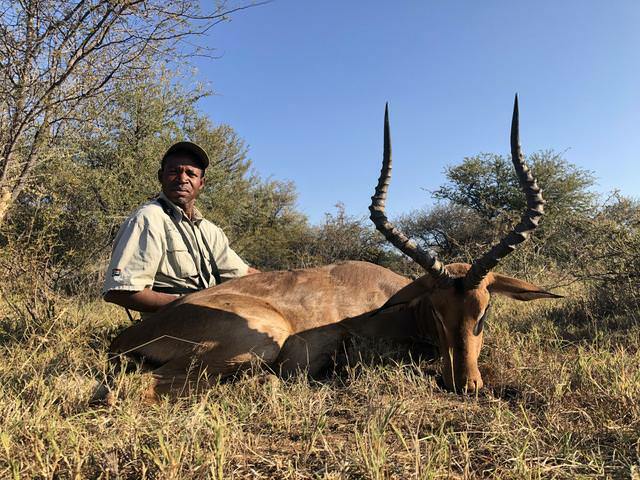 I suggested we take my .30-06 with in case we needed “longer legs” than those of Frank’s .470 - which was just as well… as, when we did find the Bushbuck he turned out to be in an open area about 200 yards out. I handed Frank my .30-06 and he took care of the rest. This was the end of Frank’s hunt. 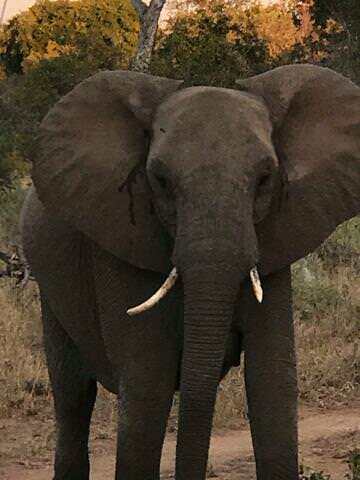 With three days to spare I drove him and Lola to Pilanesberg where they enjoyed nature and game watching for the last few days. 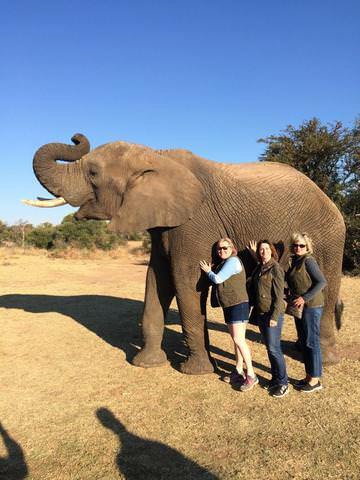 A few days later my friends - Daryl and Collene accompanied by new friends Dawn and Michelle from Alberta Canada arrived for their adventure with CT Safaris. Great reports! Your clients are taking some very nice trophies. 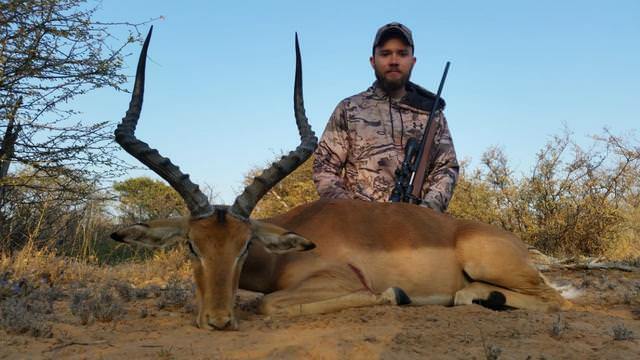 And so Daryl did in 2014 when him and 3 friends hunted with me in Kwa Zulu Natal. We had a blast and I believe 31 quality trophies were on their way back to Canada some months later. Subsequently Daryl and Collene’s home in Calgary became my “home away from home” when exhibiting at shows in Alberta over the last 3 years… In 2016 Daryl mentioned that he and Collene had two lady friends who were seriously interested in a photographic safari to Kruger. After discussing different options with them and their friends, agreement was reached on a two week photographic / hunting safari for June 2018. Daryl would be the only hunter and his “harem” as the rest of the clan fondly became known over the next months would participate in some of the other attractions we have on offer. I picked the Sultan and his harem up from Africa Sky Guesthouse on June 4th and we left for Kruger right away. 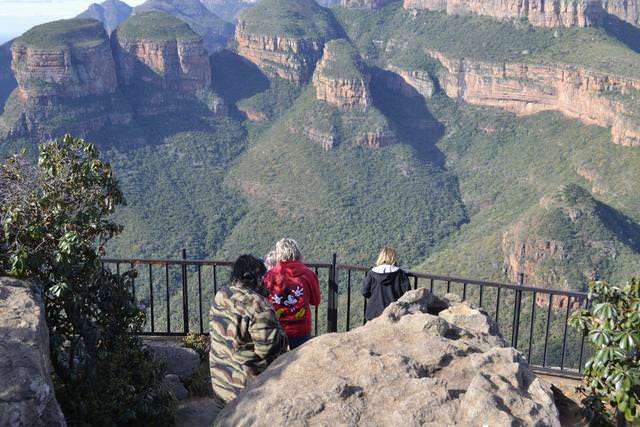 En route we stopped over at some of the attractions along the Panorama Route such as God’s Window and Three Rondavels. 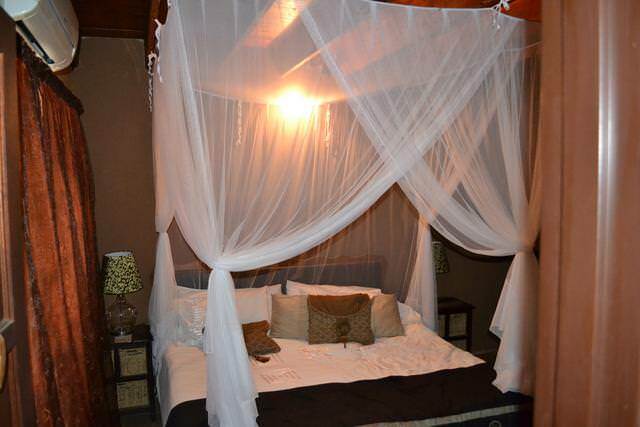 We arrived at our villa on the South-Eastern side of Kruger that afternoon. 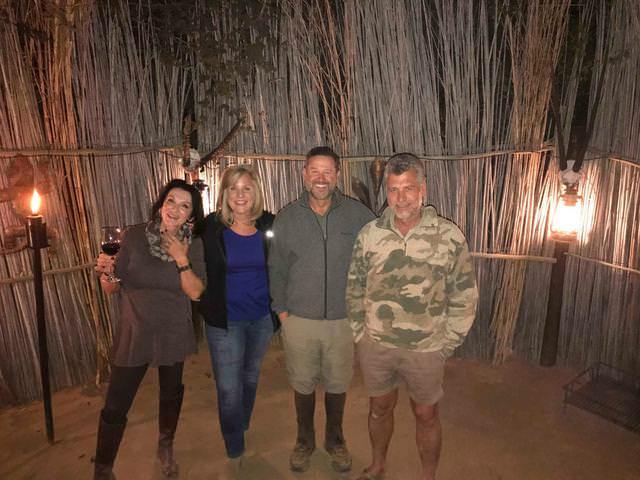 That night, after enjoying a South African “braai” under the stars and rekindling some fond memories of past hunts and visits, we went to bed amidst the call of Hyena and the roar of the Lions. The following morning we were up early and headed out to into Kruger for the first day of our photographic safari. 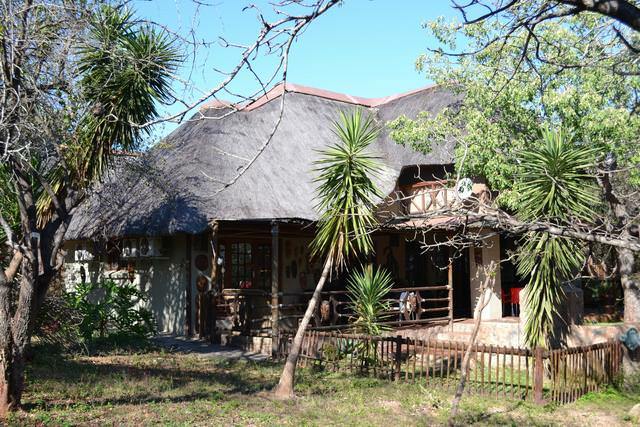 After two days in Kruger we made our way back to our home - Sabrisa Ranch. 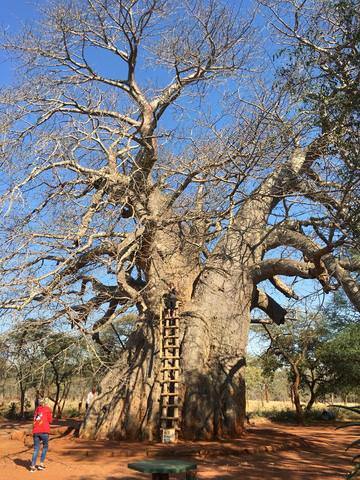 En route we stopped at a 2,000 year old giant Baobab outside Gravelotte. The Girls were in awe with the size of the tree! 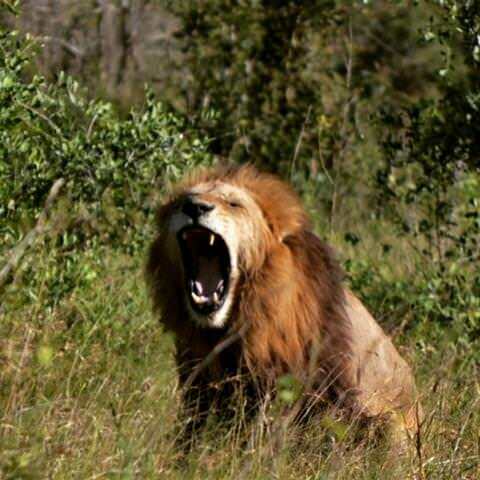 I guess by now the “Harem Owner” was already gritting his teeth as, as much as he loves watching wild animals and big trees, he also enjoys hunting and 5 days had gone past in Africa, only shooting animals through his camera lens. 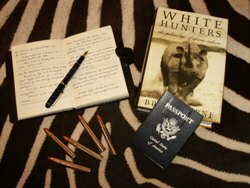 Having hunted many of the species available for hunting during his first two safaris, Daryl’s list was not an extensive one. 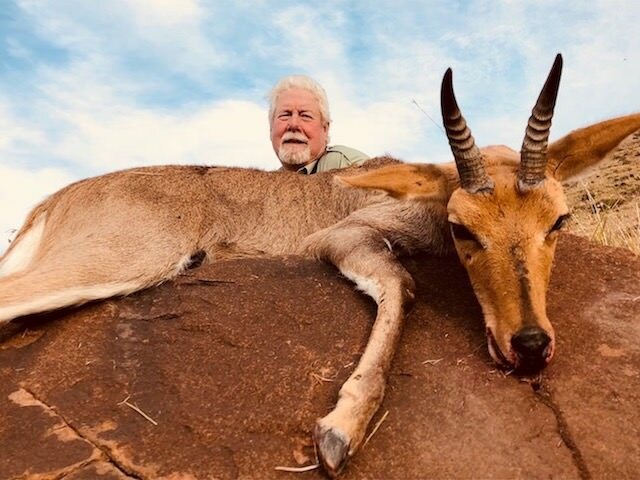 He really did want to hunt a Blue Wildebeest and an Eland (which were two animals he didn’t get on his earlier safaris). Apart from that, he didn’t have any major expectations. 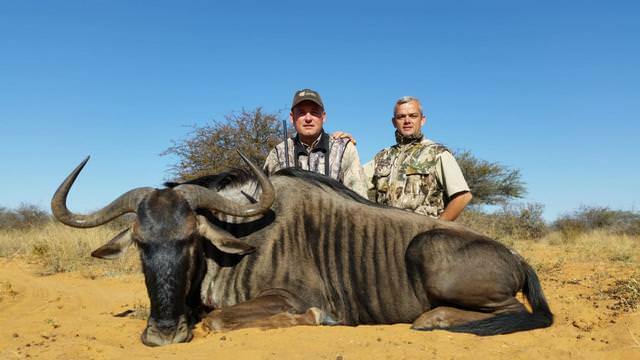 So our first day home we went looking for Blue Wildebeest and a nice one we got! 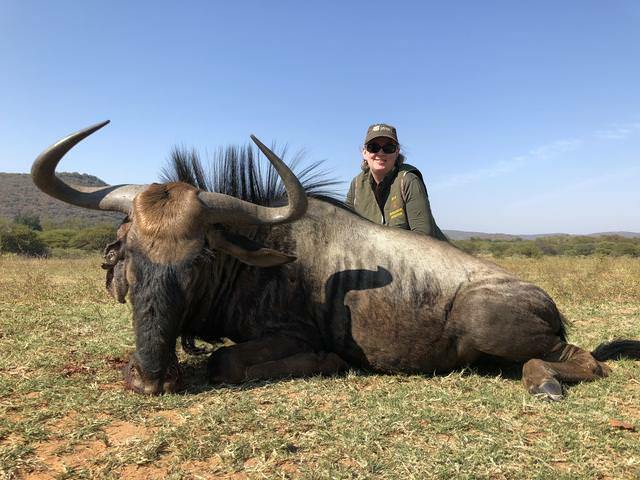 When one of the harem members saw the patterns on Daryl’s Wildebeest, she wanted one too and it so happened that we came across a young split Wildebeest bull the next day that had a broken leg and an abscess in his ear so the lady got her rug courtesy of CT Safaris. 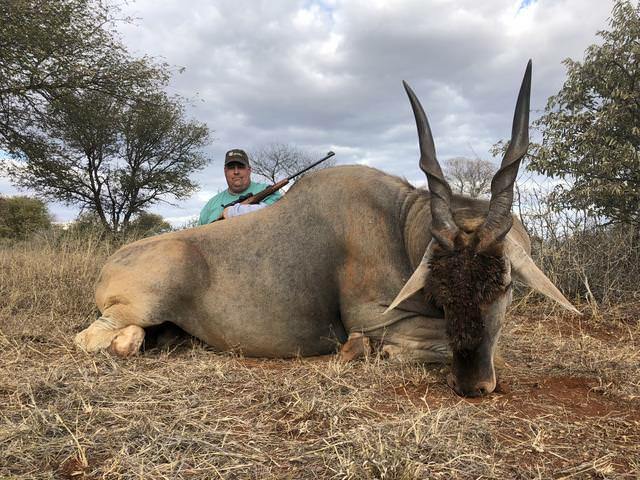 The next day we went out Eland hunting. Daryl hadn’t brought his own rifle along on this trip and had been using my .30-06 for all of his hunting so far. 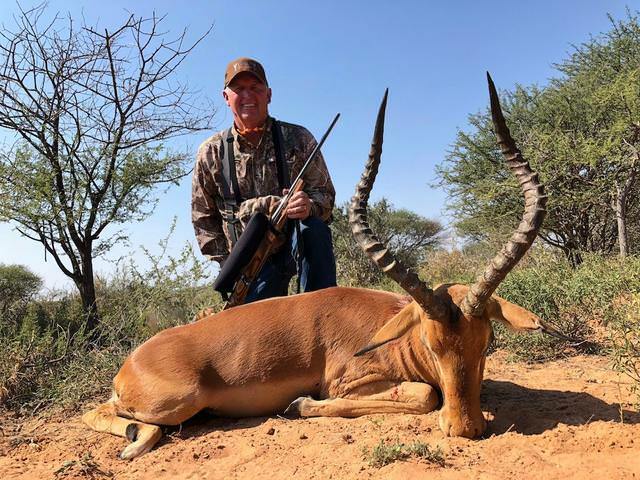 He is also a man who keeps track of every different caliber he’d used to kill animals with during his hunting career and as he had never killed anything with a .458 LOTT I offered that he use mine to hunt his Eland with. After a whole day of cat and mouse and many hours on the tracks of a herd of Eland, we finally found the herd just before dark - about 700 yards down a road. We quickly got off the road into the brush and made our way towards them as quickly and silently as possible with the brush as cover. By the time we got to within about 100 yards from the herd there was very little daylight left. We carefully crawled back into the road and I set up the sticks. Daryl had the .458 up but the fixed magnification Leopold 2.5 X 20 mounted on my CZ is not designed for such low light conditions and Daryl didn’t feel comfortable to shoot so I handed him the odd six. A wary Eland cow must have seen our excessive movements and the herd started making their way down the road. By the time Daryl had them in the scope again they had moved another 50 yards or so down the road but fortunately they stopped and started milling around right in the middle of the road. By the time we got down to the spot where the bull was when he received the second 180 grainer, it was seriously dark and we were now down to using flashlights to try and find blood - which we did… Nice frothy lung blood! Our elation was short lived though, because after an hour on the diminishing blood track it was clear we were not going to find that bull the same night. I had discussed the possibility of getting a helicopter in to assist us with our tracking endeavors with Daryl the night before and he agreed that, if this was to be the last option left for us, we should do it. Well the time had come for us to make that decision, so we made it and the helicopter was called in. The pilot and I took off in search of the Eland bull. This is an activity that is often more difficult than what it is thought to be as, if a wounded animal like the one we were after finds itself under a tree at the time you’re flying over it, it is easy to miss it from the air and the area we were in comprise of more than 10,000 acres of bush veldt which in places are very thick. I heard a shot and saw the bull stumble. I didn’t hear another shot over the whine of the rotor above me but saw the bull stumble again and heard the pilot say: “that’s it, he’s done for,” as the bull came to a standstill, swayed and slowly collapsed. 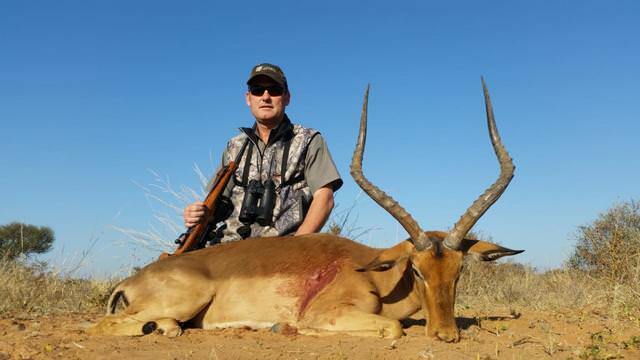 It turned out that Daryl had shot at and hit the Eland twice in the run with the .458 at more than 150 yards. 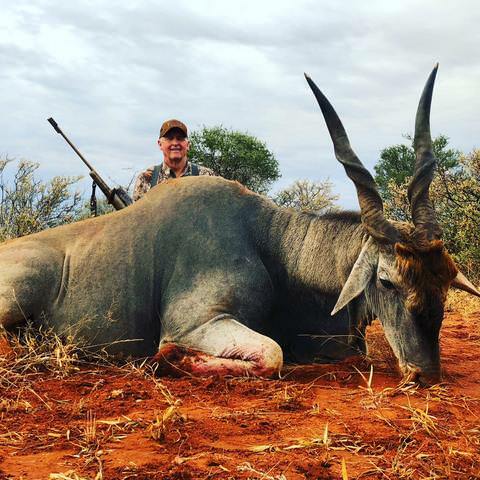 More importantly, he didn’t just “hit” the Eland, he did so perfectly on both occasions - hitting it in the engine room twice - which would explain the two “stumbles” I saw from the air and the bull going down shortly thereafter. 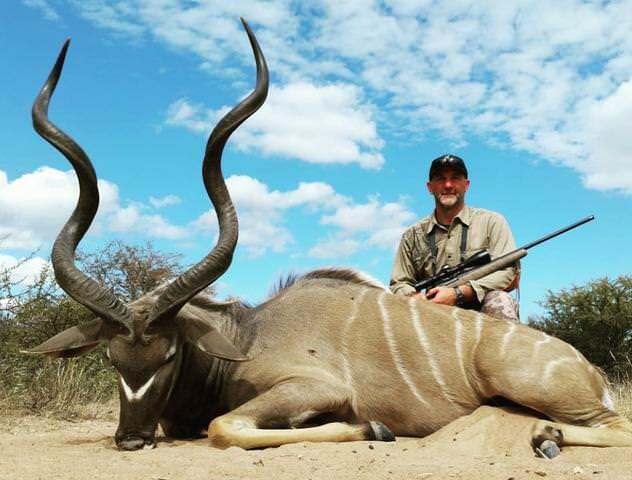 As expected from the caliber and bullets; both 500 grain Barnes’s solids had blown holes straight through the Eland. 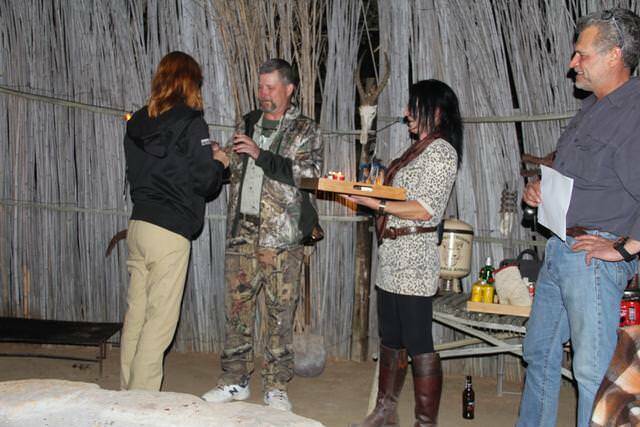 While Daryl was hunting his harem was kept occupied with some of the none-hunting activities we have on offer here at CT Safaris. They spent a day being pampered at the local spa and also went elephant-back riding nearby. 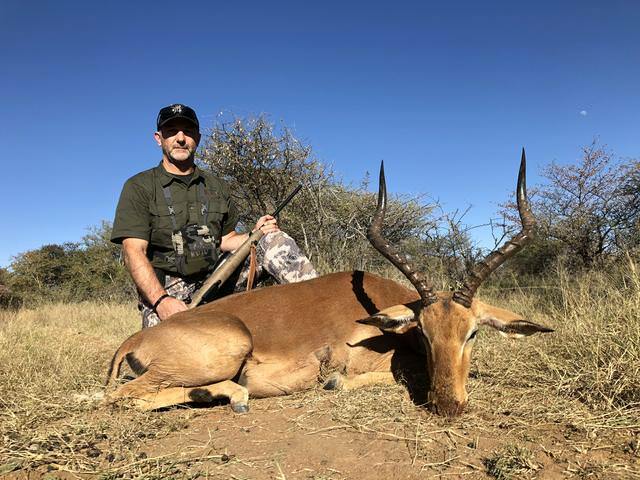 We also had some Impala that needed to be culled - which was a nice way to keep ourselves busy with the last couple of days before Daryl and his harem left back for Canada. Great reporting, Chris. I enjoyed the hunt, as did Janet. Reading the hunt report has been fun, also. Thank you and Sabina for hosting us and always making a plan for success. ...I say that hunters go into Paradise when they die, and live in this world more joyfully than any other men. Thank you Tom! It was both a pleasure and honor hosting you! 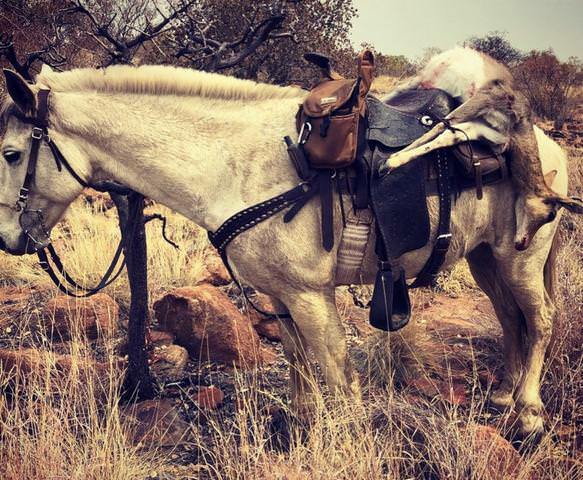 CT Safaris has been offering horseback hunting for several years and we’ve had quite a bit of success hunting this way. Our horses roam free night and day and only come in to the stables in the early mornings and late afternoons so they’re used to the wild game on our land and the game is not overly disturbed by them. 1.) We can ride into and explore areas that are inaccessible by vehicle. This is extremely useful - especially in the mountains surrounding Sabrisa Ranch. 2.) The sound of horses hooves on the ground and rocks is not foreign to wild game so they’re not disturbed by it. 3.) As a general rule; animals see riders on horseback as a unit and don’t perceive them as being dangerous as long as you stay downwind. Jim is an able horseman who spends much of his free time riding his own horse back home and him and Joco - one of our Boerperd horses got along just fine. Jim had three animals on his list - a good Kudu, an Impala and a Wildebeest which he only wanted for the skull and rug. The following day we commenced with our hunt and first tackled the mountains of Sabrisa Ranch - looking for Kudu. 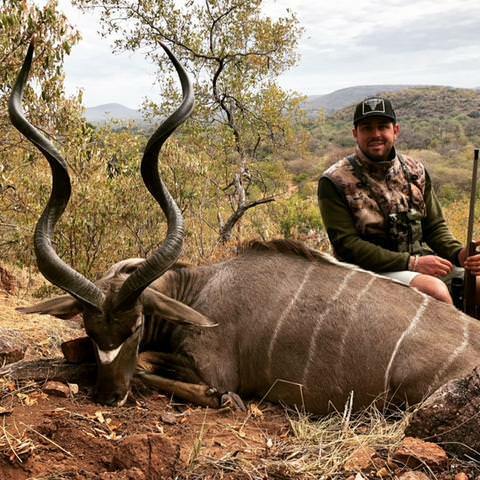 A good Kudu bull was spotted laying down on a mountain ridge and we made a plan to get closer to it on foot. 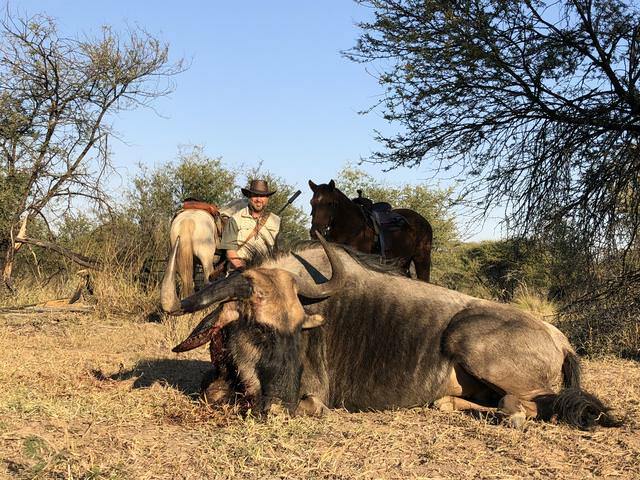 My next-door neighbor has several split Wildebeest bulls on his property and seeing that Jim was after the experience of hunting on horseback as opposed to collecting trophies and he only wanted a rug and skull from his Wildebeest, I suggested that we target one of these bulls on horseback. After a few hours in the saddle we found a group of Wildebeest and dismounted for the stalk while Sammy stayed behind with the horses. 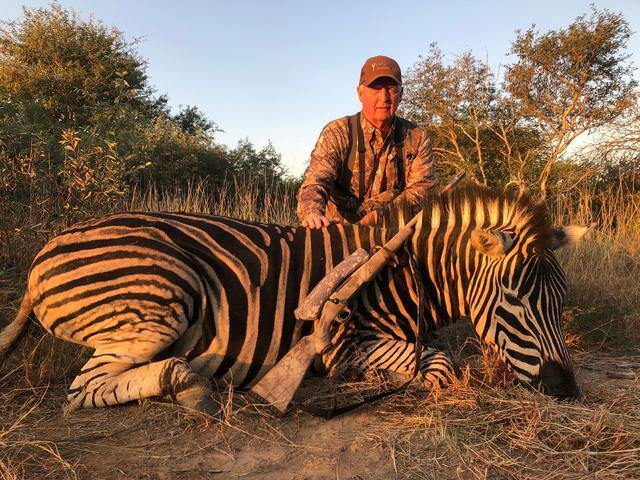 And so, Jim and Jennifer’s horseback hunting safari came to a successful end and after five days in their lovely company they embarked on the next part of their adventure - a two day safari in the Timbavati next to Kruger National Park - also arranged through CT Safaris. 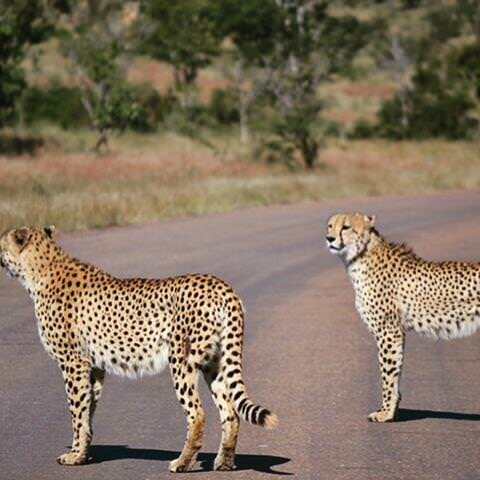 They were both astounded by their experience in Greater Kruger and saw lots! 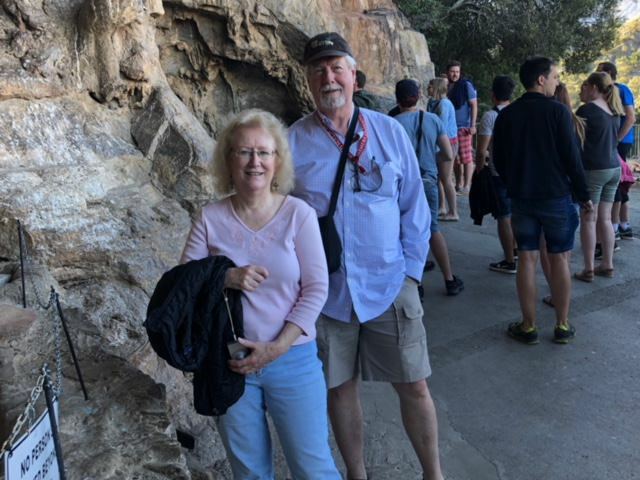 Bill and Karen hunted with me back in 2012 and as with most all of my guests we had stayed in touch. Bill had a big event coming up in 2018 namely his and Karen’s 30th Wedding Anniversary! On top of that it was also the Birthday of their twin girls - Kate and Stephany. 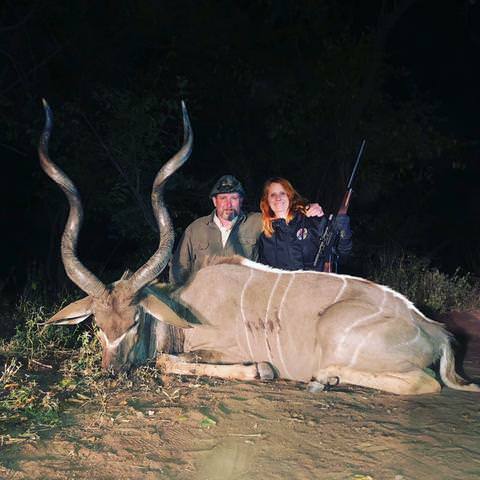 In 2012 Kate tried for Kudu but the hunting gods weren’t working with us that time so this time a Kudu bull was on top of her list. 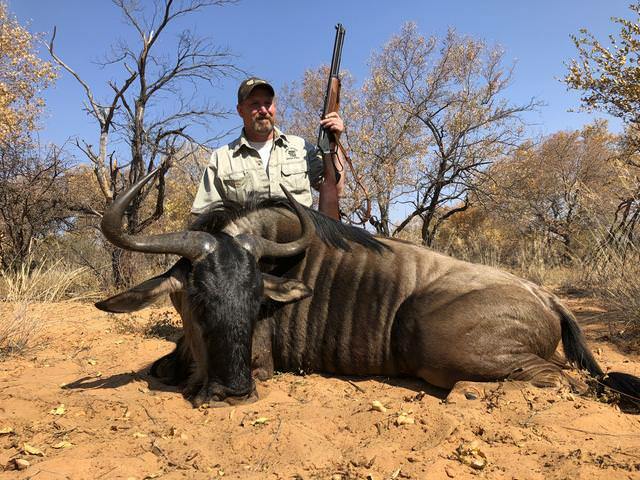 Bill, on the other hand couldn’t connect with a Blue Wildebeest on his first trip and getting one with his 45-70 with open sights was a priority for him. Being the girls’ first time in Africa and being sponsored by Dad - their list included Impala and Warthog. This lovely family were accompanied by their friends - Lindsay and Taylor - who were also here on their first trip to Africa. 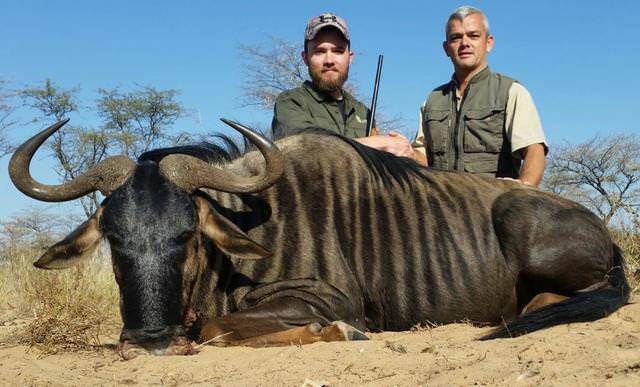 Both had bought package hunts including Blue Wildebeest, Impala and Warthog. After dinner, “Pastor Chris” called everyone to order and proceeded in leading a ceremony for the renewal of Bill and Karen’s wedding vows. As “rings”, two elephant hair bracelets - courtesy of CT Safaris - were exchanged by the couple and a merry time was had afterwards. 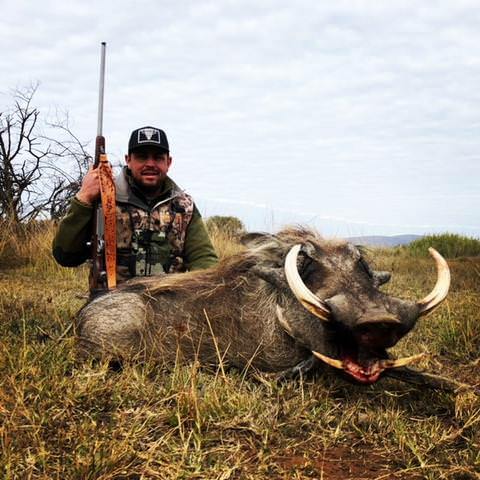 Now there’s this “hotspot” I know of that is very good for Warthog mid to late morning. And this spot is a “vlei” (or marshland) close to my home. 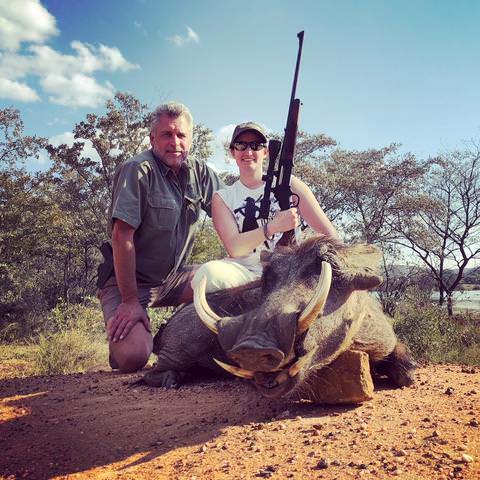 So after driving around for most of the morning in pursuit of Wildebeest with a few unsuccessful stalks, Kate and I dismounted from the truck and stalked towards my Warthog hotspot. 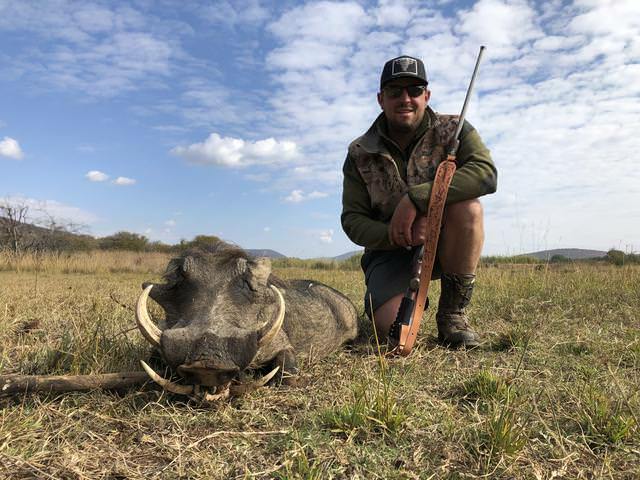 My hotspot didn’t disappoint and one shot from Kate’s .308 Lever Action made by Henry Repeating Arms resulted in one very dead Warthog. A very worthy first African trophy and wonderful Birthday present! Meanwhile, Lindsay - accompanied by PH Willem - had some success of her own. That afternoon, as we were about to settle down for some sundowners in our boma, Sammy came rushing in… “Boss Chris, you must come quick! There’s a Kudu on the way to my house!” We piled into (and onto) the Cruiser and followed Sammy’s directions to where he’d seen the Kudu. There was just enough light left by the time we’d stalked up to the Kudu bull for Karen to make a perfect shot and make her dream of hunting a Kudu in Africa come true! 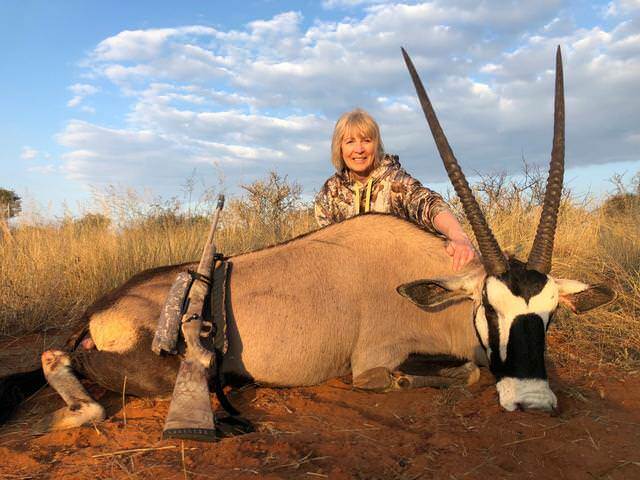 Karen got her Kudu - and that on the first hunting day! A really old bull with hardly a tooth left and worn down tips! What a terrific Wedding Anniversary Gift! 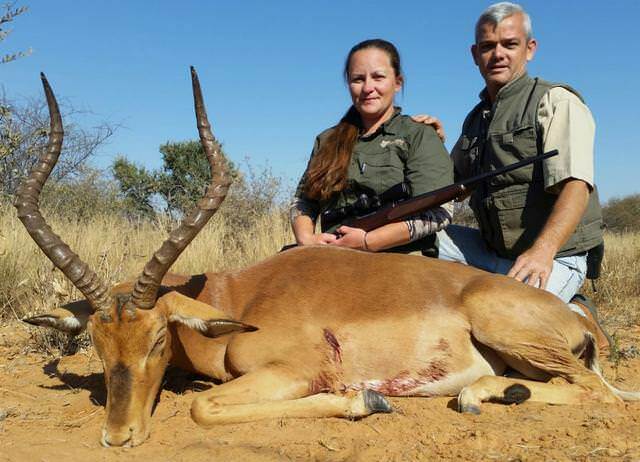 The next day was Stephany’s turn and she was rewarded with an Impala for her efforts. 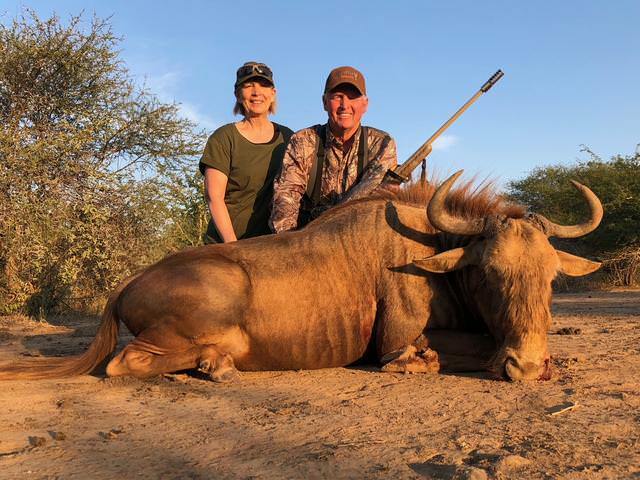 On the same day Tailor connected with a Blue Wildebeest Bull and Lindsay with an Impala. 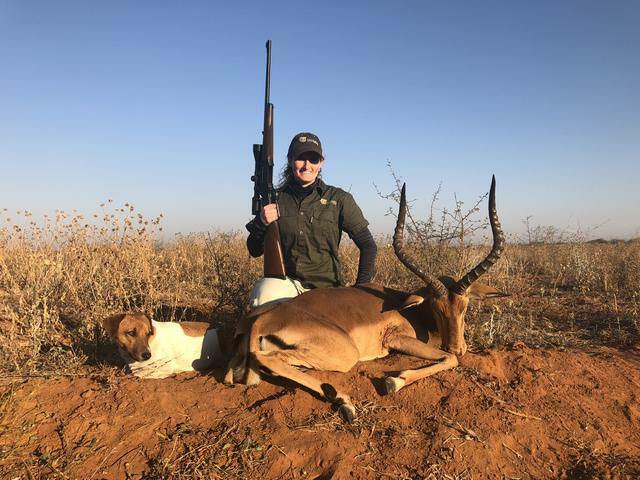 Kate shot her Impala at 200 yards early the following morning. 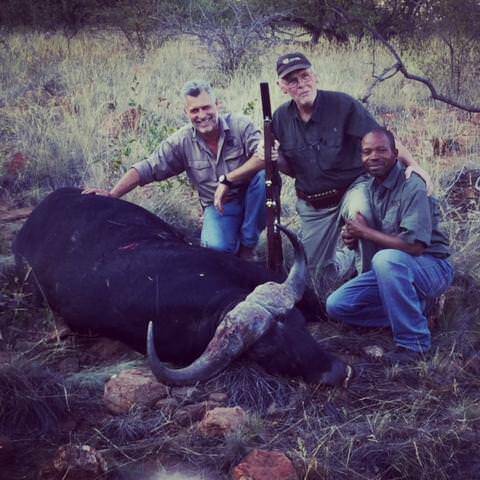 We continued our quest for a Blue Wildebeest bull for Bill but while we saw quite a few, a decent bull stayed out of reach of his .45-70. Sometimes you’re lucky in the hunting field and sometimes you’re not. Whilst it didn’t appear to have started out that way, today would turn out to be an incredibly lucky day for us! We had been following the wounded bull’s tracks for hours and it things weren’t looking good. To be honest; we had all but given up and I suggested we get back into the truck and drive around the block the bull’s tracks had disappeared into. Something caught my attention some ways off in the distance to my right. It looked like Blue Wildebeest horns but I wasn’t sure and I was just about to ask the Anton (the landowner - who was driving for me) to stop when Anton stopped on his own. He had seen tracks of a Wildebeest that had crossed the road in front of us and wanted to investigate. So while him and Sammy were busy doing this, I took a walk in the direction of where I’d seen what I’d thought to be Wildebeest horns. And the next moment - there it was! He was laying down under a tree - about 100 yards from me - looking at me. I managed to get the attention of Sammy - who was still analyzing the tracks crossing the road and mouthed: “Gun, bring a GUN!” Having worked with Sammy for many years he fortunately correctly interpreted my frantic movements, got hold of Bill and Anton and brought them over to me. 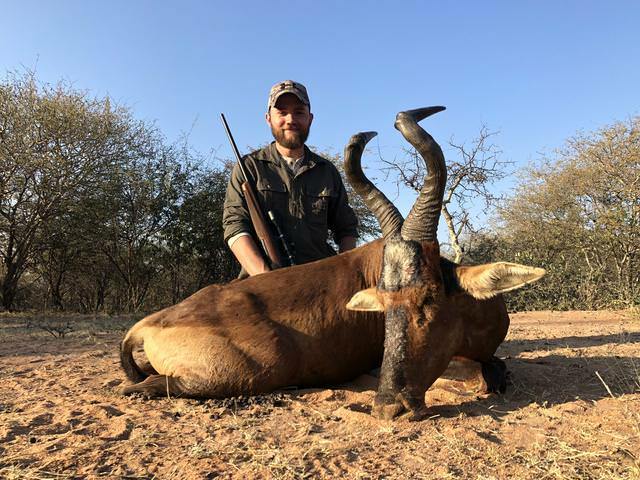 Taylor’s package included a Warthog but we came we came across this Red Hartebeest bull and in a spur of the moment decision Taylor made his shot count. 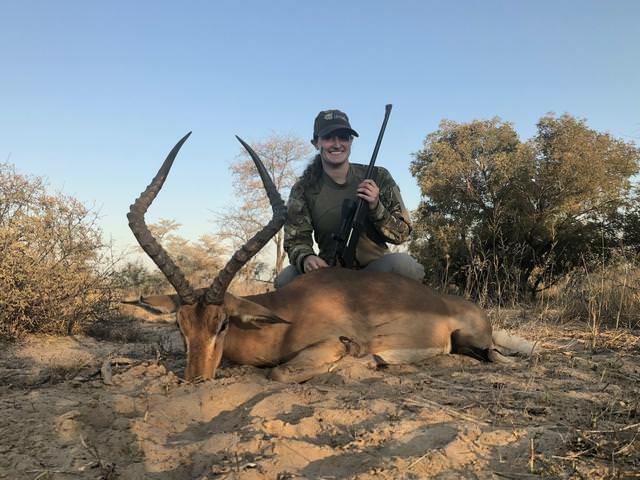 By day 5 our hunters had gotten everything they came for and then some… But after shooting a one horned injured Gemsbok as a cull animal, Lindsay decided she really needed one for her trophy room too. 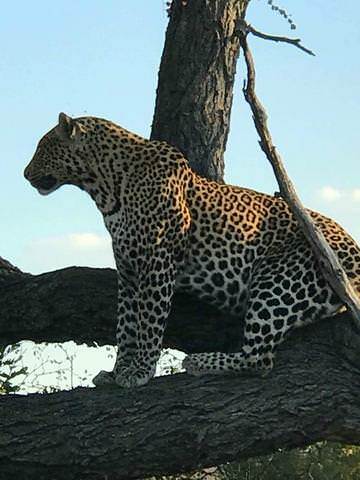 It was the end of the hunt and time to head back to Johannesburg for the group’s return flight back home. Old friendships were rekindled and new friendships were formed and I’ll be looking forward to their return in a couple of years for their Cape Buffalo hunts. Lots of happy adventures there, Chris! After dropping the folks from Maine off it was straight back to Africa Sky to pick up my next group… Nick, Scott and Darin from Alberta Canada. I first met Nic and his father-in-law - Darin - in when exhibiting at the Calgary Boat and Sportsmen Show in 2017. 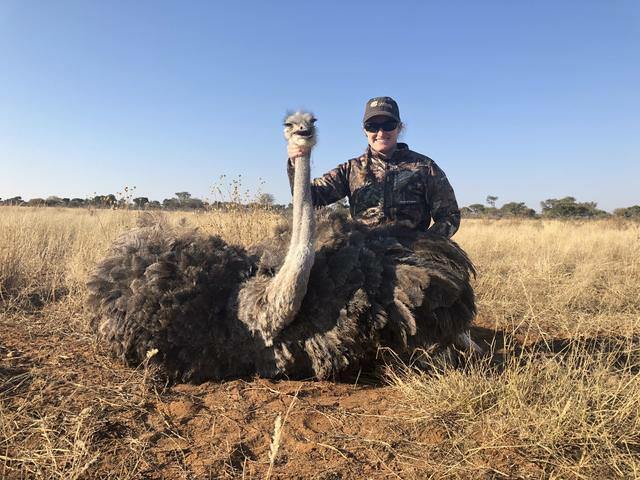 When seeing and hearing what CT Safaris has on offer, Nic was pretty keen to come and hunt Africa that same year, but at that time his son was still in diapers and his mom-in-law didn’t share Nic’s enthusiasm as she was the one who’d have to assist with babysitting while Nic was away so he postponed until 2018. We commenced hunting at sunrise and for this day’s hunt I had chosen one of my brand new concessions that has not been hunted for the last 6 years. 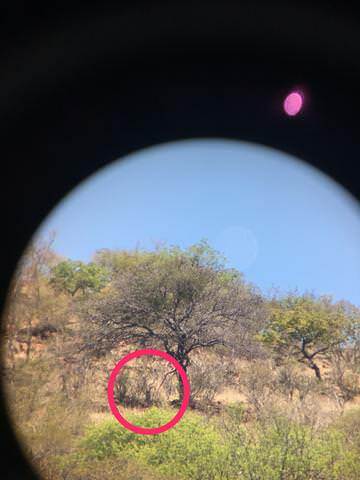 We found the Hartebeest in the picture below within half an hour after entering the property and Nic’s .300WM worked for the first time in Africa. 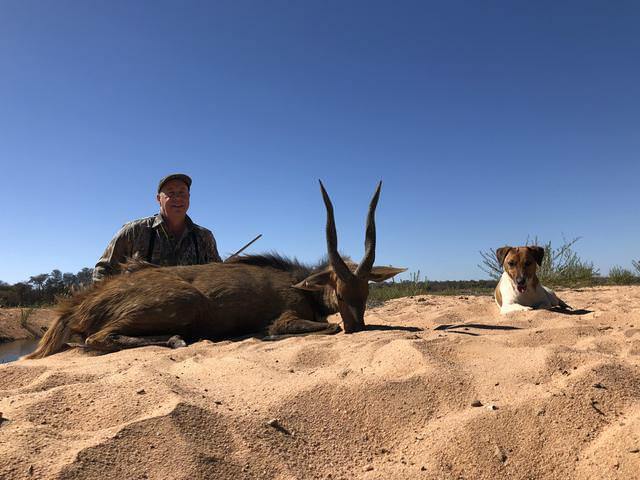 Meanwhile, Scott, accompanied by PH Willem, connected with a very nice Impala and Gemsbok bull. 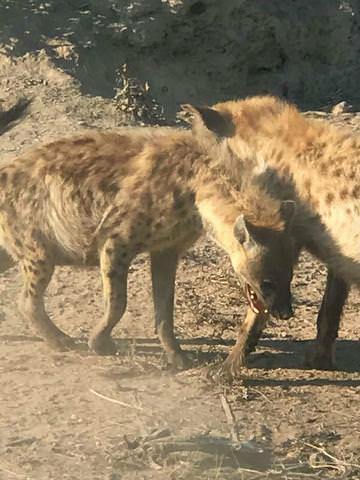 The following morning we headed across the road to another new concession with the hopes of finding a good Sable for Nic and perhaps an Impala for Darin. Whilst there is a high density of game on this property, it is very thick in some parts and it is also more than 15,000 acres in size so I decided to send another vehicle in to cover more ground and see if they could find fresh tracks to work on while my hunters and I started hunting the opposite side of the property. We were cruising down a track when I saw an Impala Ram disappearing into the bush some ways in front of us so Darin and I dismounted to go have a closer look while Nic stayed behind on the truck. We soon figured out this was a lost cause as the bush was incredibly thick and the Impala wouldn’t give us a shot so we turned around and started making our way back to the truck. I looked up and saw Nic in the road - in front of the truck - frantically waving and motioning for us to get there quick. 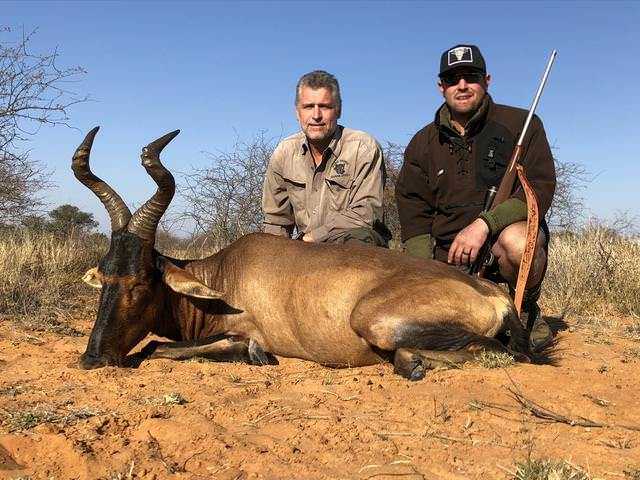 When we got back to Nic, I looked down the road in the direction he’d been joining in and saw a nice Impala ram - broadside - 80 yards down the road… I quickly got Darin onto the sticks and he hit the ram beautifully with his 7 Mag. 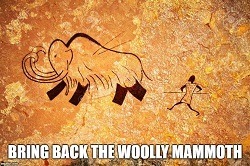 The ram took off to the right and I was just about to gather the sticks and walk up when something incredible happened. A Sable bull came trotting into the road from the same direction the Impala had disappeared into and came to a halt in the middle of the road. He stood there - looking at us inquisitively. It looked like a big bull but it is impossible to judge a Sable’s horns when he looks directly at you so we had to wait… It seemed like hours but was probably only a few seconds before the bull turned his head and I saw it was a good one. Nic’s shot hit the mark and we had a dead Impala and dead Sable in a matter of minutes! 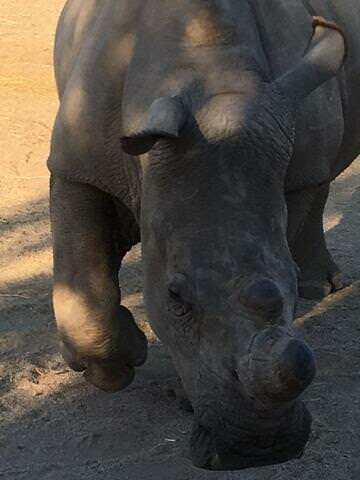 With two animals already ticked off of Nic’s list it was time to give Darin a next chance. 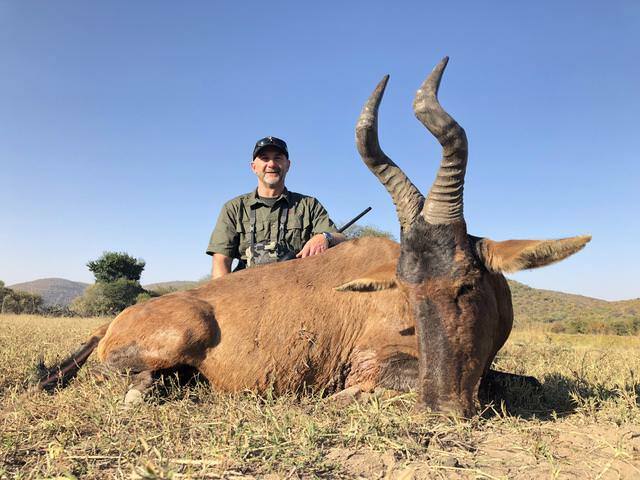 Whilst Red Hartebeest was not on Darin’s original wish list, he developed a serious interest in adding one after he saw the one that Nic had shot the previous day so that afternoon we went looking for one. We spotted a group of Red Hartebeest in the middle of the vlei and had to make a plan to get closer to them - which we managed to do after a lengthy stalk through the bush. The bull we were after was the herd bull and he made quite the effort of keeping the cows and young ones between us and them but after about 45 minutes he stepped out and Darin’s 7mm took care of it. When we had talked about Nxala and the potential size of one here in Limpopo, I had committed to not letting him shoot anything under 27”. Great was the surprise to us all when we connected with the (almost) 31” bull later that evening! The trophy quality in my areas that hadn’t been hunted for 6 years was really beginning to show! 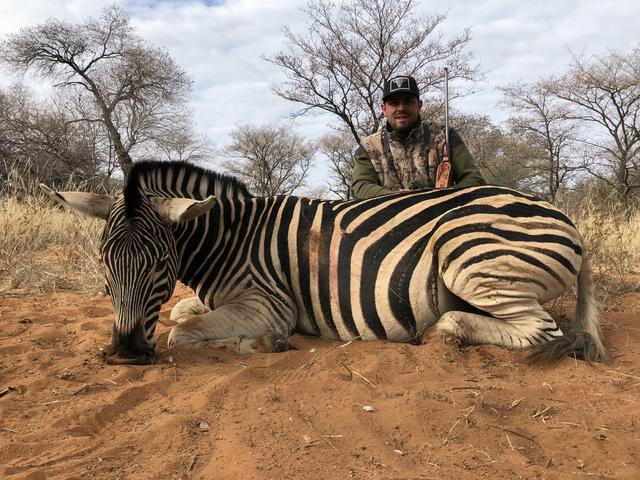 Another species of interest to Nic was Zebra and a nice Stallion we got the following morning. 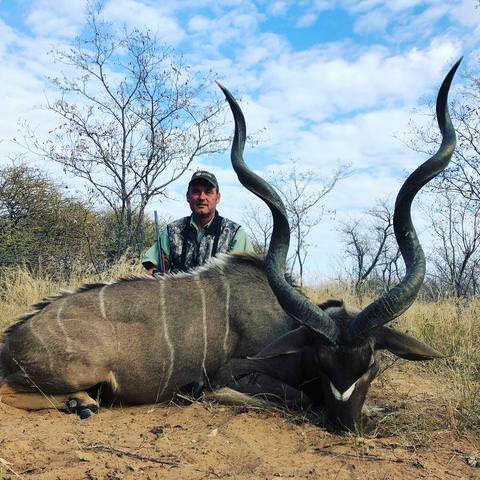 I took Scott out the next day to see if we could find him a Kudu and we got lucky again. 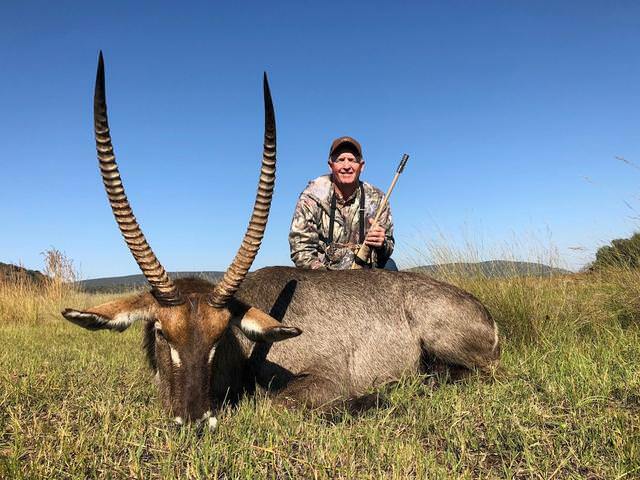 Scott also got lucky on a 30” Waterbuck bull. With one day to spare and everyone having gotten what they came for plus some more, Nic decided to add another Zebra. 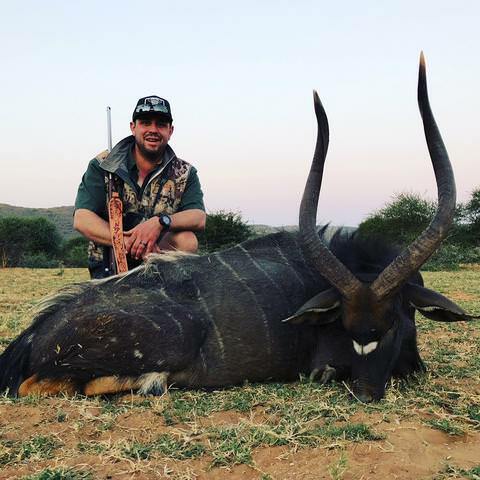 For the last several years, I’ve been hunting (amongst others) Reedbuck and Vaal Rhebuck with my good friend - Evan Couzens from Umziki Hunting Safaris down in the Midlands of KZN. Evan has some fantastic areas, is an excellent PH and my clients and I have had good success hunting with him. 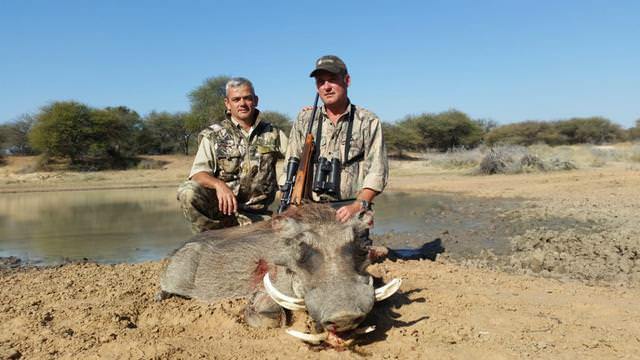 Chris’ hunt started off with a bang when this Bushpig made its appearance in broad daylight on the first hunting day. Sabrisa Ranch has always produced good Bushbuck so we first had a go at a nice ram I’d been seeing on the river side of our property. This ram turned out to be a sneaky fella… We saw him a bunch of times but he was either running or hiding in some seriously thick stuff and would never present us with a shot. Then; one day our luck changed… While driving, we spotted the ram in the thick stuff and put on a stalk. 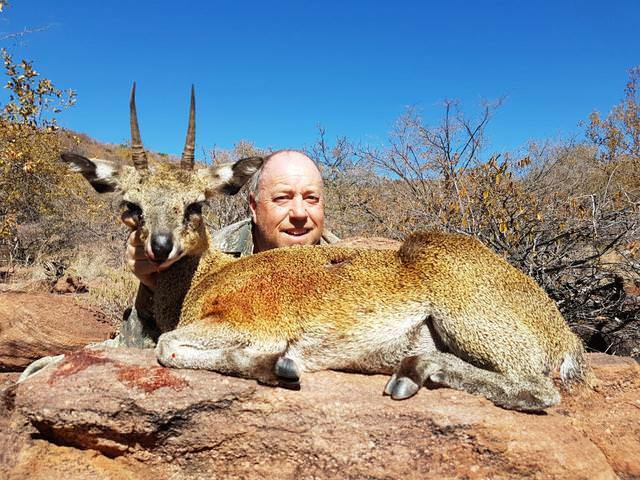 The next moment a Bushbuck burst out of the bush and the call was made to shoot it. The angle wasn’t great and as it turned out, the hurried shot wasn’t either. I called in the help of my tracking dog - DT - who took the track immediately and shortly thereafter, we heard him barking ferociously some ways off. Sammy and I broke the 100m hurdles record, running through the thorn bush and found DT fighting the injured Bushbuck yards in front of us. My 30-06 ended the fight and we had Chris’ Bushbuck. Closer inspection revealed that this was not the same Bushbuck we’d spotted from the truck. It was a smaller male that must have been hiding in the same area as the big one so we started making plans to get a bigger one. This plan came to fruition a couple of days later when we connected with this 17” ram! It looks as if many others have enjoyed their hunts with you as much as I did. I remember meeting Daryl and Colleen when I was over there. As soon as I can talk my wife into going, I will be back. Too many things going on right now, including trying to get an appointment for a surgical removal of my gall stones. Some nice pigs you've got there Chris ! "Up the ladders and down the snakes!"